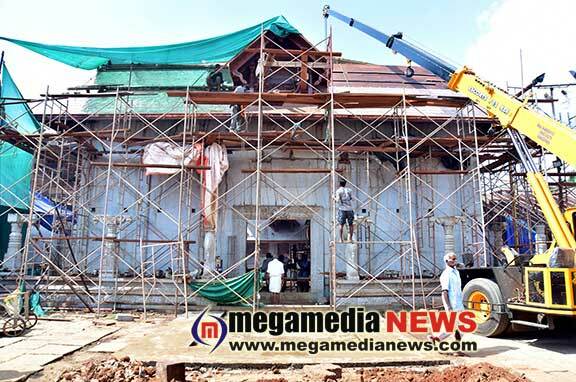 Mangaluru: The renovation work of the 1,700-year-old Sri Rajarajeshwari Temple in Polali is in full swing and the Brahmakalashotsava will be held in March 13, 2019. 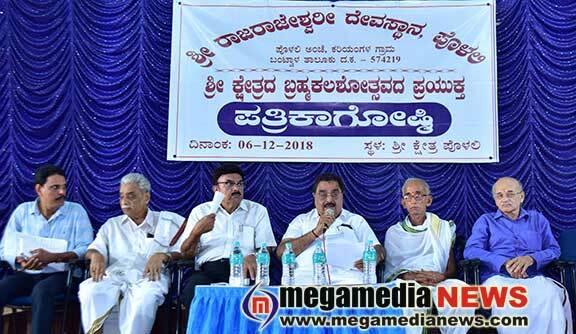 “The punarprathishta/reconsecration and Brahmakalashotsava rituals will begin on March 4,” former minister and Brahmakalashotsava committee chairman B Ramanath Rai informed media on the Polali temple premises in Bantwal taluk on December 6, Thursday. According to legend, the clay idol of Goddess Sri Rajarajeshwari, the presiding deity of the Polali temple, is consecrated by Suratha Maharaja. Since centuries, the temple’s administration has been managed by the heads of Ammunjeguttu, Ulipadigutthu and Chera family. The priests from Bhatra family are serving as the chief priests of the temple. The consecration of Sri Durgaprameshwari, Sri Rajarajeshwari, Sri Mahaganapathy, Sri Subrahmanya and Sri Bhadrakali will be held on March 10. The Brahmakalashotsava of the deities will be held on March 13. The new temple mast will be erected between March 10 and 13. The teak wood for the temple mast is donated by Billava Samaja. The wood is now soaked in gingelly oil for seasoning. The annual, month-long temple fair will begin on March 14. The previous Brahmakalashotsava of the temple was held in 2001. Initially, a 16-member renovation committee was formed with MP Nalin Kumar Kateel as chairman. Subsequently, however, Kateel was replaced by Ramanath Rai. 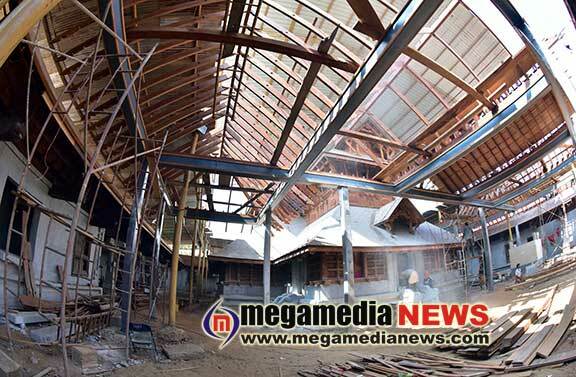 The renovation work is being carried out under the guidance of temple architect Mahesh Muniyangala. Ramanath Rai said that work – including that on the sanctum sanctorum of Goddess Sri Rajarajeshwari, Sri Kshetrapala Sannidhi, the new temple mast, Vasantha Mantapa, Ullaklu Magrantayi Daivasthana Gudi, casting of silver, brass, copper on the temple walls, pillars, and the doors – has been planned at a total cost of Rs 19 crore. “An amount of Rs 6.64 crore has also been collected from devotees in the form of donations. Besides, individuals and organisations have sponsored works worth Rs 3.50 crore. Many devotees were involved in voluntary works. The government has permitted the temple to utilise an amount of the Rs 5 crore generated by the temple,” Rai said. Speaking of the work, 85% of the work has been completed and works worth Rs 11.72 crore have been implemented. The remaining work will be completed in the next two months, Rai said. Temple priest and hereditary administrator Madhav Bhat said that the devotees of the ‘Saviraseeme’, comprising 16 villages around the temple, are requested to perform austerities from January 15 until the end of Brahmakalashotsava. “Consuming meat and liquor or holding marriages and other joyous functions within the borders of Saviraseeme is forbidden, considering the sanctity of Brahmakalashotsava,” Bhat reminded. 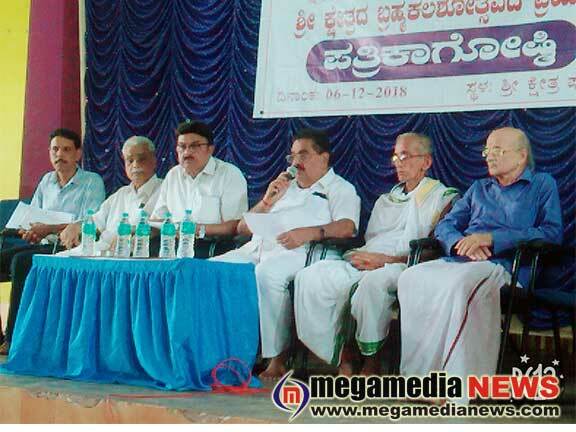 Temple managing trustee Dr Manjaiah Shetty, Renovation and Brahmakalashotsava Samiti general secretary U Taranath Alva, temple hereditary administrator and priest Chera Suryanarayana Rao and chief executive officer Pravin were present at the press meet.